Love is in the air this Valentine�s Day season! 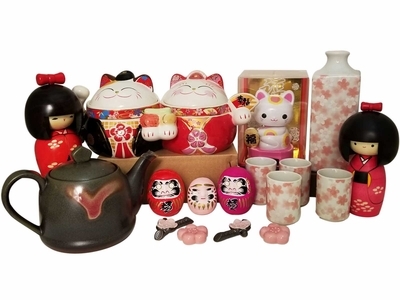 Surprise your special someone with a top-notch gift during this particular time of year, whether it be a beautifully designed item from our wide assortment of Asian tableware or an enchanting present from our collection of good luck items. Our extensive supply of Valentine�s Day gifts provides you with high quality goods that will serve as perfect presents for your significant other, ranging from useful Japanese Tenugui Hand Towels to captivating tea sets for two. The pink and white color schemes that you�ll find on many of our items, like our Japanese paper wallet, our donabe clay pot, and our dessert plate set are not only perfect for this romantic season, but also year-round as well! The cherry blossom design that you�ll find on many of these items symbolizes the beauty of life and how life should be spent with loved ones, a perfect message to send to whoever you�re spending this Valentine�s Day with. Enjoy this Valentine�s Day by buying your special someone a stunning gift that they�ll love for years to come! Japanese Kabuki Play" Sake Set (LAST ONE)"